It has been sooooo hot in Kentucky this week! 101, 104, 105 Too hot!! Factor in the humidity, and we haven’t ventured outside for much this week. We’ve had to water every night, as it is so dry here. We haven’t had rain in over a month, and our county (and surrounding counties that I know of) are under a burn ban. There were storms yesterday that went through Ohio, part of Kentucky and West Virginia yesterday, but we didn’t get any rain from it. We had some wind, but it was a hot, straight from the furnace wind, not a cooling wind. Hopefully we get a break from the 100’s and get rain SOON! 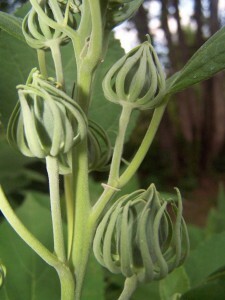 Last week I shared pictures of the mystery plants that grew from the compost. I said I thought they were watermelon. Well, I was wrong. For this plant anyway. It appears to be a cucumber. 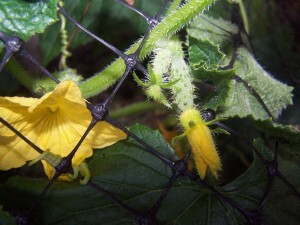 I have Armenian Cucumbers planted in the vegetable garden, so this volunteer will be nice, too. 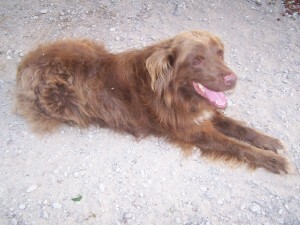 Here’s Shadow, our Australian Shepard lounging in the driveway. I sure don’t know how he can handle these temperatures with all that fur! He has been enjoying the ice water I’ve given him every afternoon. I just love the buds on the Hibiscus plant. 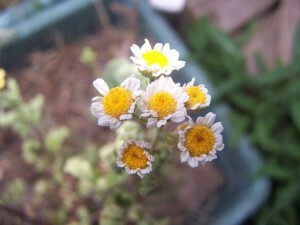 The Feverfew is blooming. It’s in a planter by the front porch. I don’t think I’ve been watering it enough, but the flowers are looking pretty. 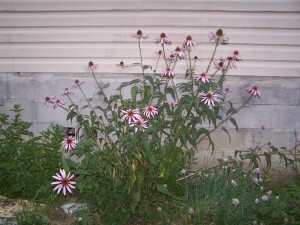 The Echinacea is in full bloom, with the Peppermint growing on the left, and the Chives on the right. I made homemade mint chocolate chip ice cream using the fresh peppermint. It’s so yummy! 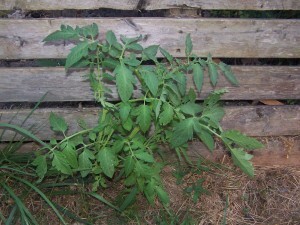 This volunteer tomato plant growing through the slats of the compost bin is getting big. No flowers yet, though. There are two more growing on the inside of the bin that is made from pallets. While I was out taking pictures, I found this strange flowers growing in the pool. Recycle, Reuse, Repurpose Dresser as a Planter – I love this! I love finding Volunteers in the garden. It always feels just like a gift…and it is. My favorite volunteers are the giant nicotiana that comes back every year and smells so sweet. They followed me from my former home. I didn’t plant them. Oh it looks like you’re getting the heat we experienced during our dry season Feb-Apr, and with RH of 85-90% we cannot venture for a few minutes outside. It gets too sticky. At least in your case your vegies and flowers can still grow, ours are totally brown even the grasses. Andrea recently posted..Encounter with the Night’s Queen!